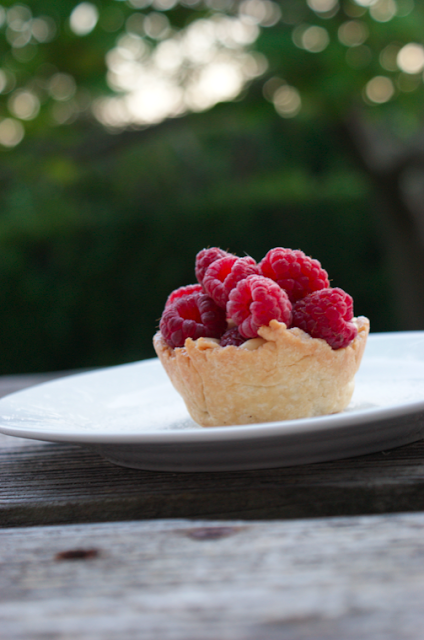 Home grown raspberries are like nothing else. They're at their best if picked straight off the bush and naughtily eaten, but they always retain their truly superior flavour until their mouldy demise. I actually managed to keep my paws off these for two days - a record, perhaps. 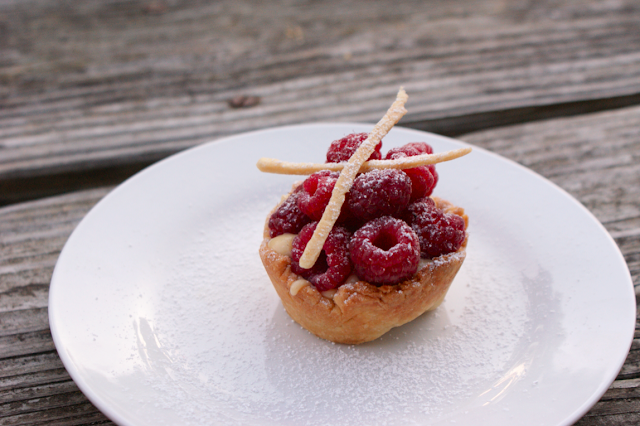 I wanted to make some little tarts with them - a little like the ones I wrote about buying in Oxford - but without the thin cake layer and jelly on top. I had a bit of a pastry disaster with these. I've been making a lot of pastry recently - particulary shortcrust - and pulled out all my new cooling tricks and so on to create the best tasting dough I think I've made so far. 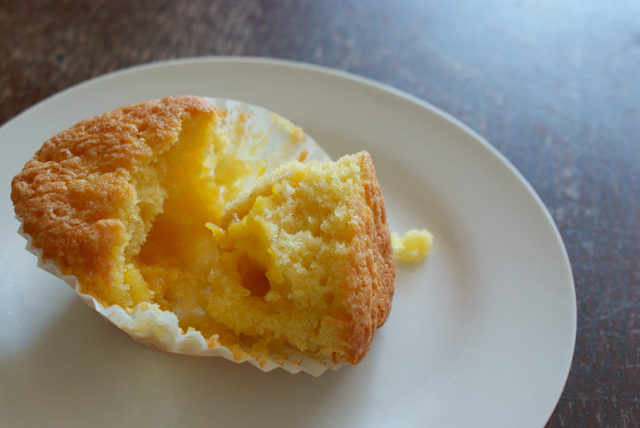 I popped circles of the pastry into four muffin indents. I got excited by the little pleats they had made all by themselves just by folding in. So I popped them in the oven and starting faffing about with the ends of the pastry making strips and so on. Five minutes later I realised the complete lack of blind baking going on. So I took them out, propped the sides back up, put in some cases and ceramic baking beans and tried again. They turned out okay (definitely edible!) but perhaps not the perfection I was expecting from the dough. I also wasn't entirely happy with the crème pâtissière recipe I used. I think I'll try another when I make it again but I've included it and my changes anyway. Usually I find Nigella faultless, so I was a bit surprised - but the colder Aga plate was rather cold, and my technique was probably wrong - I feel I should have beaten the eggs and sugar more. Still, despite the various problems, they were really lovely. 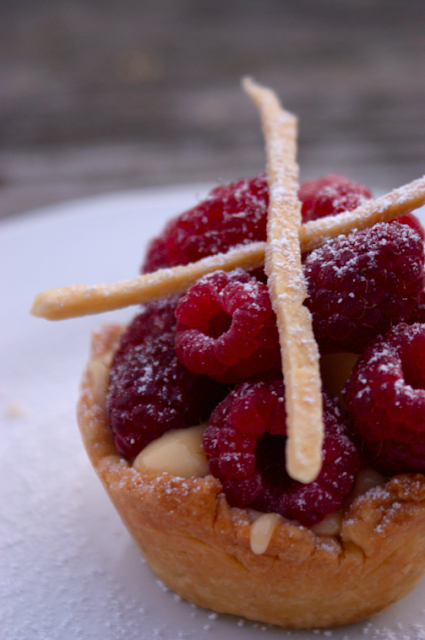 The raspberries could have made anything shine and the dark chocolate really complemented the sweet custard. Edit: I've removed the recipes as I'm not happy with them and don't want you to try them and be disappointed. I haven't posted here in months. It hasn't been through lack of cooking since my holidays started - I think I've spent more time cooking in the past few months than ever before, but for some reason, posting here just didn't feel right. I suppose part of it could be that I've been making much more savory food than before, and that's never seemed newsworthy. I did try a few times - I uploaded photos, wrote out the titles, but I never managed to put words to it, to actually post. I tried again a week or so ago, after coming home from seeing Julie and Julia. But then yesterday two things happened: I came down to Cornwall, where I went to have a break from uni and cook exciting things for this blog in May; and I got the first comment for ages... and this commenter had actually made one of the recipes! I made these cupcakes yesterday. They don't look anything special - perhaps I should jolly them up with some icing sugar or icing, but I love them as they are. 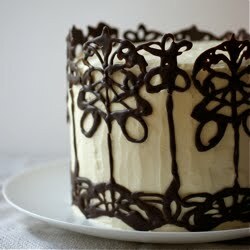 The tops are slightly crispy, the cake is fluffy and moist and it's all undercut by sharp lemon filling. 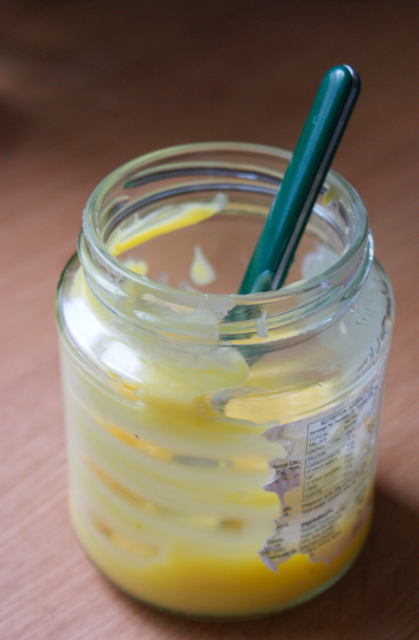 I had this jar of lemon filling left from a Lemon Meringue Pie I made a few days ago which needed using. So I decided to riff upon an old recipe for Chocolate surprises with a square of chocolate hidden in the cake, and put a spoonful of the filling in. I didn't have any extra lemons with me (or any cupcake cases so they're all folded into muffin cases!) 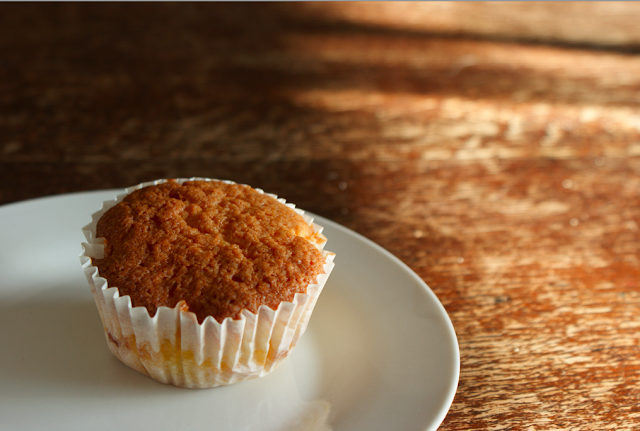 so I added the filling to the cake mix as well, which gave them a lovely subtle flavour. The filling I used was from Angela Nilsen's fantastic Ultimate Lemon Meringue Pie recipe. A simpler curd would also work (such as the one I made in this recipe), if you're not making a Lemon Meringue Pie soon! Cream the butter and sugar until white and fluffy. Add the egg with a tbsp of flour and beat in quickly. Sift in the rest of the flour and baking powder and mix till combined. Add the curd and stir in. 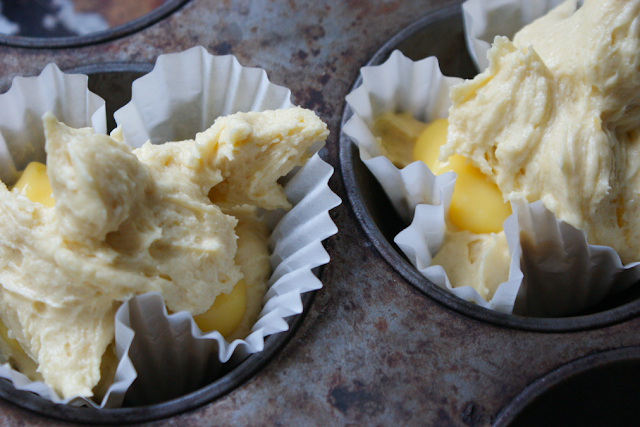 To create the cupcakes, put a heaped spoonful of cake mix into each case, then make a little well in the middle. Spoon in a tsp of curd into the wells of each. Top with the rest of the mix, pushing it down to the sides to cover the curd. Bake for 20 minutes or until browned.